Japanese saws are used by traditional Japanese woodworkers known as Shokunin. This master craftsman occupies an important role within the community and is considered a person of very high-status. For many years, the wearing of swords was not allowed. As a result, the local sword smiths started crafting edged tools. Because the sword smiths also had a respected place in the Japanese culture, the edged tools they created were respected as well. The well-defined traditions of Japanese woodworking are a unique culture and one that creates some rather exquisite finished projects. 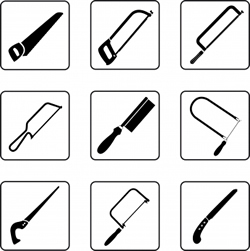 There are a number of different types of saws. One of the most common is the nokogiri. This saw is very different from a western woodworking saw. The cut is done on the pull stroke instead of the push stroke. One theory of why this saw is created that way is because a Japanese craftsman sits on the floor. This makes it very difficult for them to put enough pressure on the push stroke of the saw. Because of this design, the blades could be made much thinner. This means that you get a straighter, thinner cut on your stock. Another popular Japanese saw is the ryoba. This is a double-edged saw with two different type of teeth. One side has crosscut teeth and the other has rip teeth. One of the benefits to this saw is that you can start the cut with the crosscut and use the rip teeth to continue the saw. If needed, you can take care of all the joints with this saw. A dozuki is a very small toothed saw that creates very shallow cuts. It is often used with a kataba, which is also small toothed, but can cut a bit deeper. For angled cuts, a saw with nezumi-ba or ibara-me teeth is recommended. These types of teeth are part rip and part cross. Keyhole saws, convex saws, and flush-cutting saws are additional saws that work well for the cutting in the middle of a panel. The better the quality the softwood, the better your finished project will be. Some great choices of softwood include hinoki cypress and sugi cedar. These woods, when coupled with the right saw, will produce a very smooth cut. Some saws are better suited to one type of softwood or another and when you make your purchase, keep that in mind. You can expect a blade to last about six months. The blades are not re-sharpenable, but you can replace them. There are a few saws that you can have sharpened, but these are not available in many countries, yet. Replacement blades will run about $40 - $60. Woodworking is a craft and with the right tools, anything is possible. If you are considering learning how to use Japanese saws, then it’s time to do a bit of research.